So, I wrote down a few of those same 10-second reminders again, just as I remembered them, and I added several new ones as well. Then I posted them up on the wall in my home office in clear sight. I’ve literally been surrounded by these daily reminders for a decade now. And yes, I still pause for 10 seconds at least a couple times a day, as needed, to recite them to myself. This life-changing daily ritual helps keep me centered even on the hardest days. For anyone else who’s been feeling emotionally drained and without a real sense of how to take the next step forward, I challenge you to follow my lead. It’s all about keeping the right reminders in an easily accessible location, so they’re readily available during those inevitable moments when you need them most. Note that none of these 10-second reminders immediately force you to do anything different. They simply represent a shift in perspective. And perspective is where peace and happiness begins. From there, you can change your posture from one of anxiety and resistance to one of acceptance and opportunity. The goal isn’t to get rid of all your negative thoughts, feelings or life situations. That’s impossible. The goal is to change your response to them. And this means gradually embracing life’s full range of experiences—even the draining, anxiety-filled ones. Because, too often we yearn for a very small and selective range of life experiences—the fun times, the happy days, the things that make us feel comfortable. And yet, the full range of our reality is often quite different. Life gives us an extensive array of experiences that evoke feelings ranging from sadness to regret to pride to anger to love to loneliness… to happiness to excitement and more. These feelings are all part of being a living, breathing human being. So we can revolt against the unfairness of life—the unfairness of having to deal with loss, having to go through adversity, having to feel lonely and uncomfortable and upset. Or we can embrace every experience life gives us, including all our highs and lows—all the blissful moments and painful ones and everything in between. Life is not just happy and comfortable 24/7. It’s well-rounded, it’s full-featured, and it’s real. Embracing the full range of life’s experiences today means embracing every moment with our full presence, being open and vulnerable to reality, being gentle with ourselves when times are tough, and practicing sincere gratitude no matter what happens. It means not expecting the best to happen every time, but instead accepting whatever happens every time, and making the very best of it. This isn’t easy, of course, but it’s worth working on. YOU are worth working on, 10 seconds at a time. I sincerely hope you leverage the reminders above (excerpts from our new book) to do just that. 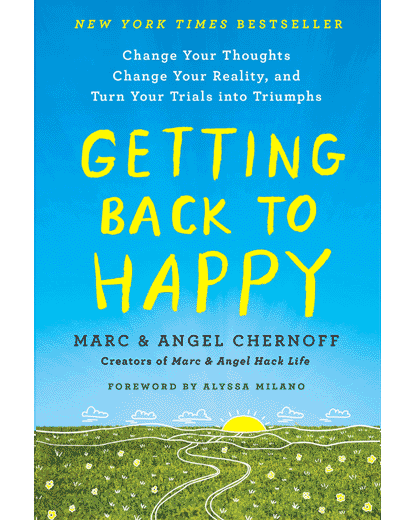 And if you’d like more reminders and life-changing daily rituals to work with, check out our new book, Getting Back to Happy: Change Your Thoughts, Change Your Reality, and Turn Your Trials into Triumphs. Love these reminders. Love you guys! The one I needed most right now is #11. I’ve been stalling on making a small change I know I need to make for myself. Also, I just started reading your new book this morning right after I received it in the mail. Two chapters in and I’m absolutely thinking differently about things. THANK YOU! Thank for the hard work of transforming your lives, documenting it, and sharing you lessons learned with others. Not easy thing to do for sure. And in this post, number 9 is the one I needed to hear most today. Marc and Angel, thank you yet again. There is someone very close to me this that both this post and your new book will be perfect for. Thanks in part to your teachings over the past year, I am already in a better place myself, but I love to follow along with your words and still strongly identify with them. I am looking forward to reading your new Getting Back to Happy book and then giving it as a gift 💜. Thank you for your amazing wise words, sometimes it’s hard to see the woods from the trees, but your 10 second reminders certainly cleared the fog and keeping the way ahead clear! Keep up the amazing work, you’re both truly doing an amazing job! Awesome reminders! Especially #1 and #5. It’s NEVER too late to pursue our dreams. Instead of rushing the process, let’s enjoy & TRUST the process. Instead of feeling behind, let’s believe that we are in the right place at the right time and things are unfolding exactly as they should – For the betterment of us….. and the world! #3 resonates with me the most.For the last 3 years i have had only failures and disappointments and I feel like my life is heading nowhere.Fun fact,I am just 18 and life already feels like too much to handle. Great article! One of your best! Just bought your new book as well. For all you have written and given “Thank you”. I know, for me, your lives have blessed my life considerably! I want to go on and on with every reason why I am so grateful to have found you. It helps me every day, it helps me help my daughter, and I try hard to use it to help my husband. Maybe someday he will open his mind. I use your words to help others in my life…friends, customers, even sometimes strangers, when they seem to need a kind word!! So many grateful words for you – for now, I will leave it at this – THANK YOU!!!!!!!! #12 hits home for me. I’ve been fighting certain old patterns of behavior (mostly involving spending too much time on Priority B items and making the Priority A’s wait) for a long time, and when I do give myself fully to the alternate approach, it’s usually for just a week or so, followed by slipping back into the “easy way” when the rewards don’t come “quickly enough.” At least emptying the email box delivers SOME immediate feeling of accomplishment. Over the long term, though, it also contributes to developing the sort of run-down “my soul is dead” chronic fatigue you describe at the beginning of your article. #5 resonated deeply for me today. Thank you! I truly can’t pick just one! Your new book is amazing, so easy to read too. I love and appreciate the ‘no blame, no shame, no guilt’ angle as those are unfortunately an easy fallback fail for me. Thank you for this extraordinary post! Thank you so much for sharing! The universe/God gives us what we need if we are just present…#12 was the words I most needed today.. I retired in December was on a great mindful pattern then hit some stressful times and it seems I have had a difficult time staying mindful of what is instead of the old thoughts and habits that I was doing so well to leave behind…lately …it has been such a pull to fall back into the old mindset…just proves…it takes daily rituals as your book states to stay on track…when I start coasting I get off track …Thanks for the helpful words today! Thank you for these reminders. Number 5 resonated the most with me today, as for the last year or so I have been thinking about (and losing a lot of sleep over) future decisions and scenarios (which may or may not come to pass) while giving short shrift as to what is happening in my life right now. (Of course, the irony is that what is happening in my life right now affects or creates future scenarios, but that does not occur to me at 3:00 a.m.) You have reminded me to live in the present and experience (and, if possible, enjoy) what is going on right now because it is as important AND it’s real. Thanks for the reminder. Oh my goodness, number 1 hit me like a load of bricks. I’m 46, I’ve been a stay at home mom for 19 years. Never had a career or really worked outside the home. I’ve been working on and forcing myself to move forward with expanding my knowledge in health and fitness and grow more as a CrossFit coach. However, many times I feel like it is too late to really do much of anything and I regret not pursuing much of anything until now. I know my inner critic isn’t being nice to me and it has been a constant struggle for a long time. Number one resonated deeply with me. Thank you! I shared your website and this post with my daughter who has also been struggling with some personal trauma. I can’t wait to buy your book and one for my daughter. I just discovered your website after listening to your interview on John O’Leary’s podcast. I’ve committed to reading your blog, definitely new posts from this point forward. Thank you for your words and sharing what has worked for you. These were amazing and each one resonated within me. I have your book and am taking your course. I just have trouble being consistent, but I’m making progress. I hope these reminders can help me stay on track. What a beautiful post. I’ve had your website bookmarked for a few years now and I know to come here whenever I’m in a poor mind space or just feeling iffy about myself. The positive encouragement and healthy reminders really help me get over my hurdles and keep pressing on especially when the going gets tough. Thank you, Marc and Angel.